This month’s Photo of the Month, by photographer Neil Fisher, shows a juvenile bald eagle perched on a fallen tree in the midst of a drenching rain. The tree’s perfect parallel guides my attention towards the left side of the image, as I envision a pristine wetland past the photo’s edge. Not only is the title “Wet Eagle” accurate of this individual eagle, but it’s also a fitting description for bald eagle habitats and behaviour in general. 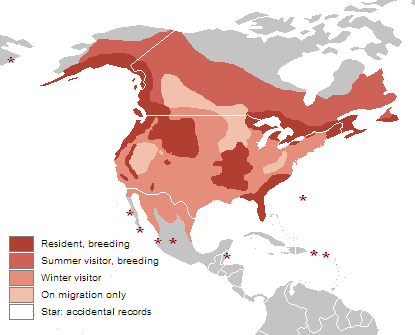 Eagle population distribution. Courtesy of WikiCommons. Eagles rely on all types of wetlands. Their diets are mostly made of fish, but also include bird and mammal species that are commonly found in wetlands. Their nests are usually found in swamps with trees that are large enough to support their large nests (the biggest one recorded was 10 ft wide and 20 ft deep). And they return to their birthplaces for breeding. Furthermore, wetlands offer an ideal resting stop for migration. Even though eagles will remain year-round in areas that have access to open water, eagles will migrate south if they live on a body of water that freezes during the winter. Considering all of this makes it easy to understand why eagles are considered a wetland-dependent species. They have a huge wingspan of up to 2.5 m (or 7.6 ft). Eaglets leave the nest at around 12 weeks old. They mate for life! Unless one of them dies or they can’t have babies. This partnership makes them effective hunters – one bird will scare the prey and another will scoop it up. Bald eagles became the US’s national emblem in 1782 and beat out Benjamin Franklin’s vote for the wild turkey. Eagles are considered a culturally sacred bird by aboriginal communities. Thank you to Neil Fisher for sharing this photo with us! He’s a regular contributor to our Flickr group and has a wide variety of stunning nature shots. If you’d like to see more of his skilled photography, click here. For a chance to be a future Photo of the Month, submit your photos here! And don’t forget to follow us on Twitter (@BCWFWetlands) and Facebook!